I started off taking these photos inside but the light was just all wrong so I ended up relocating to the backyard. 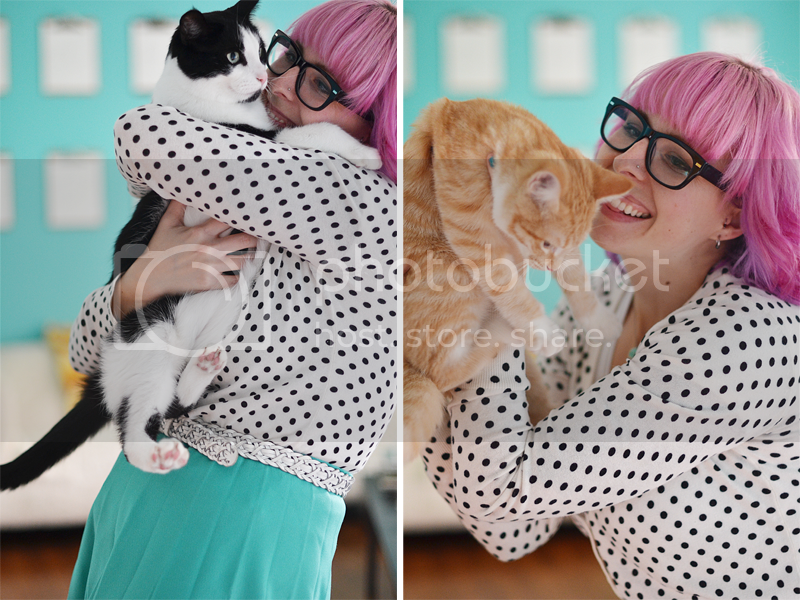 Luckily though, the lighting was nice enough for some kitty photos. Princess Log Lady is getting so big already. I can't believe how quickly she is growing despite how often I tell her that she needs to stop. She still acts like a sweet little kitten though so I'm happy about that. This past weekend we had two weddings and each one had two different groups of friends there. It was really nice to see so many friends and of course to see some awesome people get married. Weddings make me pretty happy. Today I am trying to get as much done as I can because somehow I have gotten a little behind over the last few weeks. I have some fun plans this week and I want to be able to enjoy myself without stressing about everything I have to do. Know what I mean? 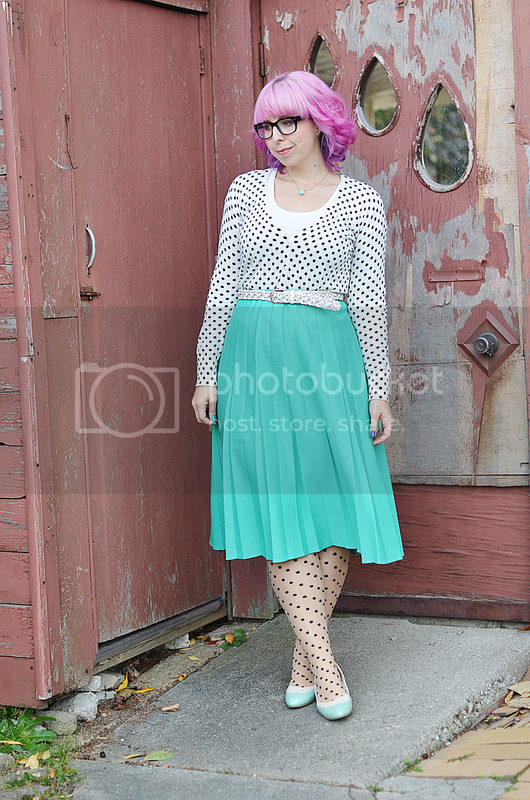 Oh yeah, and my outfit...I like polkadots. But you probably knew that already. It's been a while since I've popped over. But goodness me you are always the cutest. Gorgeous outfit and I'm loving your hair. super cute outfit - love the skirt, and of course the polka dots! Elycia, you need to give me some hair tips! I never know what to do with my short hair as it's growing out. So beautiful Elycia! :) I hope you have a good week! Ooh! This is one of my favorite outfits ever! 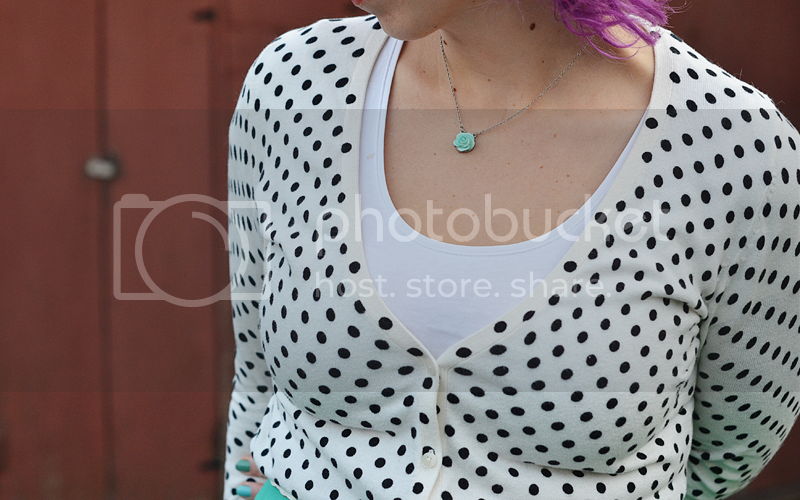 I love black and white and mint (and polka dots!!) my heart sunk when I saw the skirt is thrifted.. I want one for myself! That color is so perfect! oooooh I luuuuuuuuv the color of your skirt. And I am a definite lover of all things polka dot! All your polka dots are adorable! I just want to hug you! Your lovely ginger kitties remind me of my own cat Ringo. Princess Log Lady looks like a lady version of Ringo. I've noticed that a lot of your awesome tights are from Walmart lately. I might just have to pick some up there! Those polka dot ones are to die for. You look like a fat legged Dalmation. There's nothing wrong with fat legs or dalmations. I just want you say you're hair always looks gorgeous but for some reason it looks especially beautiful in these pictures. I love your bangs and how the color is such a pretty pale pink on top and darker underneath with a hint of purple. Plus polka dots are super cute! hehe you're so cute! I love the dots and the skirt! I was wondering, as a lovely lady of the three cat having persuasion, any tips on training kittens not to bite or not to jump on the counter? Haha, everything we try is to no avail. Woah, I TOTALLY have that skirt! I thrifted mine like... in 2001 or so! Crazy! That's so cool. You styled it well. how adorable! i love the colors of your outfit, so pretty! Ah all of the dots are wonderful! I love wearing dotted tops with dotted tights too. I can't wait to do it again once tights become a regular occurrence later in the season. The fact that your top and tights match perfectly is kind of the best ever. Your hair is such a pretty color too! I always love how often you change its color. It always looks adorable! Love this outfit on you, especially with your hair! THOSE SHOES. I keep seeing them everywhere. Oh and the skirt is gorgeous. Totally jealous of your thrifting skills. I love polka dots and your outfit is adorable! Your outfit is so cute and I love, love, love your hair here!! But, this combo seems to be made for you.